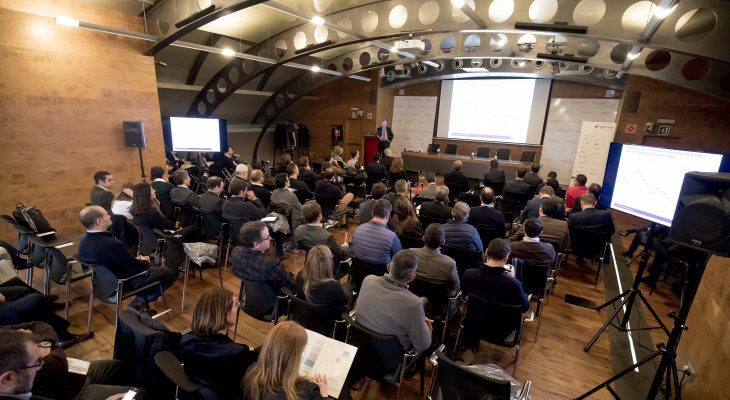 More than 170 banking professionals attended the conference held on 6, 7 and 8 February at the Business Centre, Andorra. Escaldes-Engordany, 8 February 2018. The 14th International Private Banking Convention ended today, Thursday, with the participation of private banking specialists from the Andbank Group, nearly 180 professionals of 27 different nationalities. The attendees, who participated in the conference from 6-8 February, come from the 11 jurisdictions in which Andbank is currently present: Andorra, the Bahamas, Brazil, Israel, Luxembourg, Miami, Mexico, Monaco, Panama, Spain, and Uruguay. Ricard Tubau, the Andbank Group CEO, opened the convention, followed by a talk given by Àlex Fusté, Chief Economist of Andbank, who reviewed the current market situation and gave the corporate opinion on the global economy. The main aim of this convention is to share the corporate culture and philosophy of the bank, presenting the corporate support model and some new product features. The working sessions also dealt with the changes and challenges that the private banking sector in particular, and the financial world in general, are undergoing, changes and adaptations in new regulations and possible scenarios, as well as current issues of great importance to the private banking sector. The event was sponsored this year by three leading international fund managers, who presented their products, investment ideas and opportunities in different markets around the world: M&G, MFS and Natixis. Furthermore, and following the policy of corporate social responsibility established by the bank, focussing its efforts on assisting research projects and the fight against cancer, attendees had the opportunity to attend the lecture “Fight against cancer: personalized medicine in the treatment of the disease”, given by Dr Josep Tabernero, Vall d’Hebron Institute of Oncology (VHIO). Dr Tabernero is one of the world’s most prestigious oncologists, presenting the latest breakthroughs in his conference and how science is evolving in the early detection and treatment of cancer. Andbank’s international project is one of the bank’s growth lines. Andbank, the country’s oldest private banking institution, annually reinforces this team with the recruitment of professional experts in all banking fields. The Andbank Group’s team already has more than 1,000 people, with about 400 working in Andorra, and it is present in 11 jurisdictions.